Is This the Way to Church Growth? Recently in an article for the Guardian newspaper Giles Fraser suggested the Church of England should do to its churches what Beeching did to the railways, close its underused rural parishes. He further proposed concentrating resources in churches in “minster” type churches for the purpose of re-evangelisation . Rural churches he claimed needed to close as half of them had less then 20 in the congregation, a quarter under 10. The overstretched ministers released from these churches could be placed in the minster congregations of “a community of clergy –some pastors, some evangelists, some theologians”, the team to lead the re growth of the church, making congregations “worth travelling to”, to quote Fraser’s words. My first reaction was to cringe that the answer to the church’s decline was seen to be yet more theologians and clergy, the two types of ministry not mentioned in the New Testament ! However these are serious proposals by Giles Fraser and deserve consideration. 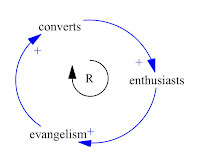 Church decline is caused by the inadequate production of enthusiasts, the spiritually “infectious” Christians who make new converts and thus generate more enthusiasts. This process creates a reinforcing feedback loop and is the engine that drives revival growth, the growth that took the church to its peak at the beginning of the twentieth century [4,5,6]. This way Christianity grows in a similar pattern to a disease. So to the two proposals, concentrating on issues of growth and decline, not the pastoral implications. a. Closing rural churches might cut parts of the country off from Christian witness altogether. This reduces the potential pool of converts and would slow church growth, perhaps put the church further under the extinction threshold . It would have to be demonstrated that these rural churches have virtually no conversion/witness and thus nothing was being lost by their closure. b. Although 50% of rural churches are under 20 that does not mean they are small. This number could be a significant fraction of their community, more so than many inner city churches. Small communities have small churches, and small communities are not going away. They need Jesus and closing a church denies them access to salvation, as well as further reducing denominational recruitment. c. It is not just the size of the church that is important but its spiritual life. A church of 20 people on fire for God will be more likely to see growth and conversion than a large church full of ineffective and spiritually dead people. It is LIFE that matters. A small number of enthusiasts can lead to large future growth of the church . It was Dr DM Lloyd-Jones who said that putting six graveyards together does not bring the dead to life, just gives a bigger graveyard ! Merging and combining small churches does not in and of itself bring spiritual life. Neither do communities of clergy. d. If the issue is the resourcing of a professional minister then do without one. Train the people in the church to act as its elders and teachers. Perhaps the Church of England needs to return to a Biblical every member ministry pattern for rural churches. Learn from the Brethren! e. If the issue is the maintenance of the building then manage without the building. But the building is not the church, and closing the building does not mean closing the church. Buildings that outlive their usefulness need to be let go so people are not burdened with their maintenance. This could mean mothballing them for a future that may need them again. It would not be the first period in history that church buildings went into serious disrepair, only the be renewed generations later. If sold for redevelopment that strategy would be lost. f. It is unclear that selling ancient buildings for demolition and development would ever be allowed to happen. The delays involved would mean the resources would not be available for years, perhaps too late. It is unclear that people would even want to develop in such spots. There are many redundant and under used parish buildings in cities. The buildings are less ancient; their sale would be easier and probably fetch a better price. g. If the purpose of closing rural churches is to generate capital, then it is unclear that having more money would improve mission. More paid clergy in towns and cities may well stifle work to empower all Christians . Ironically declining churches can be wealthier than growing ones as they contain both older and more committed people . Shortage of money is not the issue. The issue with church decline is primarily spiritual, not financial. This kind does not come out by money but by prayer and fasting, Mark 9:29! h. I can understand how a large church at a distance from rural areas can be used to replant Christianity in areas with no church. But at some point someone needs to travel to the rural area and the same issue of small numbers using a large amount of resource will resurface, with the added burden of having a fresh start. Better not to lose them in the first place. Thus the proposal to close many rural churches has issues. However if the strategy were one of keeping spiritually lively fellowships of believers in rural areas, but freeing them from reliance on paid clergy and the need to maintain a building, which could be closed if unfit for use, then the idea may have merit . It would then be worth trying as in the next 10 years many of these churches will close naturally, so the risk factor in closing them early is not that high. a. Care would be needed to ensure that the buildings in which the “resource concentrated” church meets are big enough. Whereas a church building that is too big may be a waste of resource, a building that is full each Sunday seriously hinders growth by lack of capacity. This is why churches in the past always built buildings with far more capacity than needed at the time. b. Positively, the concentration of enthusiasts, and of believers, in one place is a driver of church growth . Figure 2 shows the engine of growth, loop R, enhanced with other processes. Firstly the renewal loop, R1. The more enthusiasts the more engagement with non-enthusiastic members renewing them to infectiousness, whether they had it before or not. Also the spiritual life loops. The more enthusiasts interact, pray, worship, do Bible training, the more effective they become. They now have a spiritual disease that is more infectious, leading to more effective renewal, R2, and more effective conversion, R3. It can be shown that a critical mass of enthusiasts and church size can trigger this enhanced revival process . 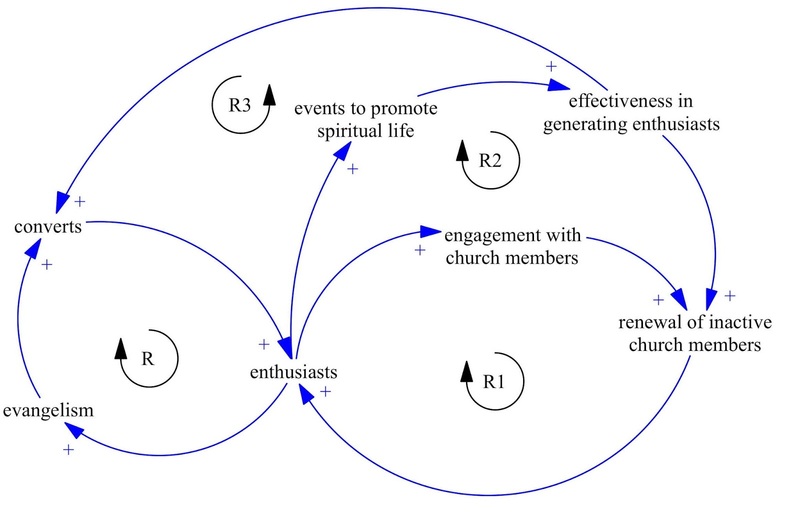 Figure 2: Church growth, R enhanced by renewal, R1, and increasing spiritual life, R2, R3. c. Churches with concentrated resources are also called Flagship Churches, ones that reproduce themselves in other churches ; and Infectious Centres of Spiritual Health , places where Christians are set on fire again for God. These are not “minster” churches as such as the concentration is of every member ministries, not paid clergy. They can be seen in many denominations and not surprisingly are in areas of large population. Although they can have a big influence in their own city, e.g. Holy Trinity Brompton in London, it is not clear they have been able to help rural areas. In principle it could work, but some research would be needed. Giles Fraser’s proposal to concentrate resources is a good idea, has been effective in the past, and is still effective in the growth of churches in London and many of the newer charismatic congregations. But it comes with a proviso. It is not just about creating churches that are worth coming to, though that definitely helps. It is about creating people that are worth living like. Ones whose lives are worth copying. People who have a passion for God, in the person of Jesus, through the work of the Holy Spirit. People who are willing to take sacrifices to ensure the lost are saved, out of sheer compassion for eternal souls. People who live in the light of eternity, not the need of the moment. People who are determined not to follow the self-centred and hedonistic spirit of this and any other age, but see a world transformed where people can live as God intended them to live. It is not about church, but about people. It is not about saving an institution, but saving souls. We must do to our churches what Beeching did to the railways. Giles Fraser, The Guardian, 15/10/15. I am OK with pastors and evangelists, but what happened to apostles, prophets and teachers; overseas and deacons? As all organisations grow there is a tendency to oligarchy and the development of a separate leadership class from the led. (See Michels R. (1961) . Political Parties: A Sociological Study of the Oligarchical Tendencies of Modern Democracy, NY, The Free Press). Christian leaders are essential, and they can be more effective when paid full-time. But their role was never to replace the people of the church and become the sole ministers, a separate priestly class, rather it was to encourage all the church to pursue ministry, especially witness and evangelism. When times are lean, paid leaders are a luxury the church cannot afford and the church needs to learn to manage without them, as it does in many parts of the world where, ironically, the church grows. In a subsequent blog I will demonstrate the hypothesis that churches decline now compared with the past because of their failure to recruit. Hayward J. (2002). 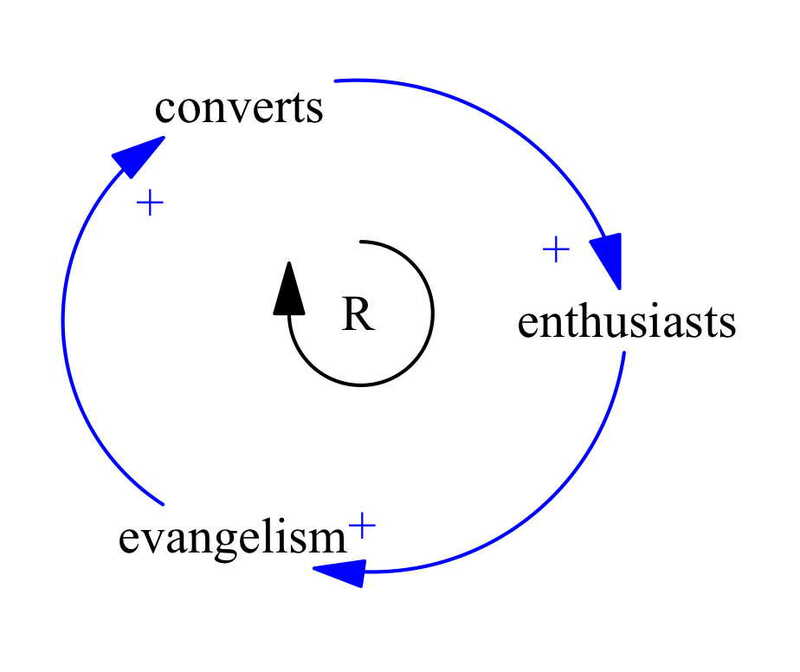 A Dynamical Model of Church Growth and its Application to Contemporary Revivals. Review of Religious Research, 43(3),218-241. Hayward J. (2000). Growth and Decline of Religious and Sub-cultural Groups. 18th International System Dynamics Society, Bergen, Norway. Hayward J. (1999). Mathematical Modeling of Church Growth, Journal of Mathematical Sociology, 23(4), 255-292, 1999. Hayward J. (2010). Church Growth via Enthusiasts and Renewal. 28th International Conference of the System Dynamics Society, Seoul, South Korea. In a subsequent blog I will give examples to show that the church growth of the past primarily came through revival. Lloyd-Jones D.M. (1986). Revival. Marshall Pickering. Davies G.. Understanding Parish Growth Stages, Diocese of Sydney. It may be argued that most small rural churches do not have a lively spiritual fellowship at their core, but just people turning up on Sunday, out of routine, demanding the services of a minister, and with no interest of putting anything spiritual into the church themselves. But it is this information that would needed to be known before any attempt at closing a churches would need to be made. Size alone does not determine viability. Thank you for your kind comments. Many clergy I have met do encourage lay ministry in their churches, especially in the scattered rural ones, so it comes as no surprise to hear you say you do this. This has been a significant and continuing trend over all the years I have been a Christian, but like all "strategies" it takes time to see fruit. If rural churches/buildings were closed early just on the basis of small size, much good work which has been started could be stopped before it has a chance to reverse decline. Looking at figures over time for congregations it is remarkable how many small rural churches have remain stable. Not a case for closure! Thank you again. This morning I led services in two rural churches, total combined congregation 35. Next week, in a different two, the total is likely to be under 10. But these figures bear no relation to the commitment or faith of the worshippers, nor of the deep commitment they have to serving their communities. Without them, this would be a much poorer place. And shedding buildings doesn't necessarily free up congregations either: all the local Methodist churches sold their buildings 20 years ago with that ambition; only one congregation now remains - the one that shares a church building with the RC congregation.